Full speed ahead. Wendy's drive-thru came in first in a survey of the fastest, fast-food restaurants. Quick: you already wasted 10 minutes on your lunch break listening to Debby complain about her new neighbors and not only do you need to do fast food, you need the fastest fast food. Which restaurant do you pick? Go with Wendy's, says the 2012 QSR Drive-Thru Study, which ranked the chain's drive-thru the service the fastest at 129.75 seconds. Burger King came in last, with a whopping 201.33 seconds. Taco Bell got second place at 149.69, Bojangles' third at 171.61, Krystal fourth at 175.94, McDonald's fifth at 188.83, and Chick-fil-A sixth at 190.06. However, speed is not really the main measure driving customer satisfaction, Brian Baker, whose firm Insula Research conducts the study, told NBC News. Not anymore. 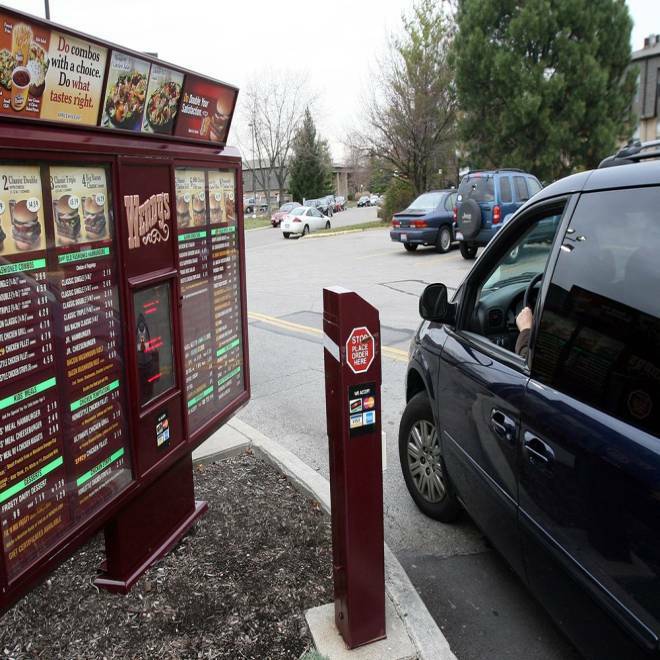 "When drive-thru's first came along, we were very impressed," he said. "Now it's become what we expect." And it's about maintaining those expectations. So customers probably won't notice much if McDonald's shaves another millisecond off its overall average turnaround time, but they will notice if it starts to lag. The annually published survey armed secret researchers across the country with stopwatches and clipboards and sent them through the drive-thru's at the nations top quick service restaurants, performing 2,053 different visits and 4,071 time studies. The study critiqued six "benchmark chains" and one regional chain, on a battery of factors, including service time, order accuracy, speaker clarity, upselling, and customer service. Rankings are closely watched by the chains; each year before the results come out, "I get a lot of phone calls from chains asking 'How did we do? Anything we should know about?'" said Baker. For instance, It can be pretty annoying if they forget your fries or give you the wrong drink, so order accuracy is another key metric to check out. There, Wendy's came out on top again, followed by Chik-fil-A, Taco Bell, and Krystal. Grit your teeth every time you're asked "Do you want fries with that?" or "Would you like to add a hot apple pie to your order?" Then look for the drive-thru with the longest line. The study found the "suggestive selling" dropped from 37 percent of the time when there were 0-2 cars in line, to only 25 percent when there were six or more cars. For the friendliest service, go to Chick-fil-A. They ranked first in the "very friendly" quotient at 57.4 percent. Burger King, on the other other hand, had the highest amount of "Rude" service (although it was only 2.8 percent of the time). What's in store for the future of fast-food drive-thru as the arms race for who can flip their burgers and fries the fastest continues to heat up? Patties delivered to your iPhone? Waiters coming out to your car on hoverboards? Nothing so futuristic, said Baker. Instead, expect more chains to add lane-splitting to their drive thrus where cars go can go off in two different directions to make their order from one of two speakers, then remerge back into one lane for order pickup.